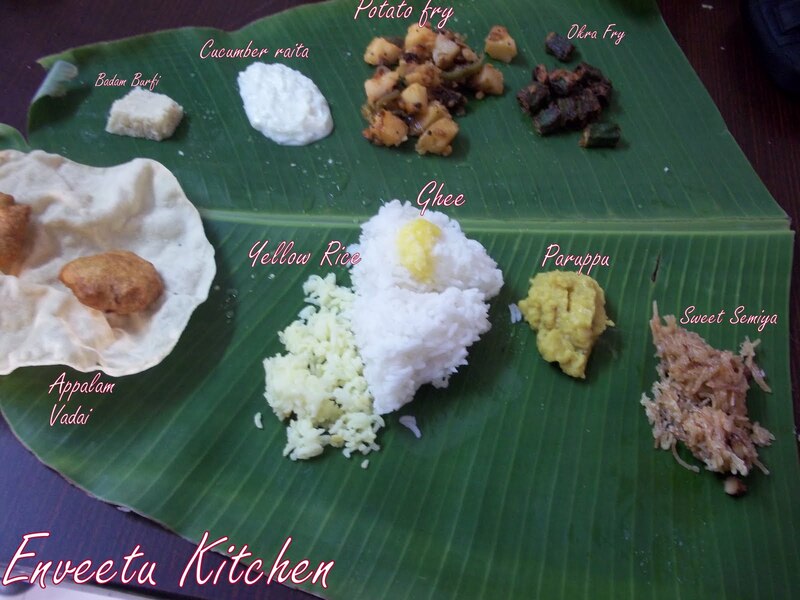 There is a Ritual called "Pongiduthal" in our Tradition. When there is a Marriage/Poonal Function in a family, the Paternal Aunt/Athai and Maternal Uncle/Mama Will do this Pongiduthal ritual to the bride/groom or to the Bramhachari/Bachelor from whom Poonal/Thread Wearing Ceremony is going to be done. We have a family friend,whose son is getting married this month, he regards my mom as his elder sister.So My Mom as his Paternal Aunt invited the groom for the pongiduthal ceremony. Wash and Pat dry the Okra's. Cut them into 1inch Pieces.Take them in a bowl, add all the flours and rest of the ingredients and mix well by sprinkling little water. Don't make it watery. 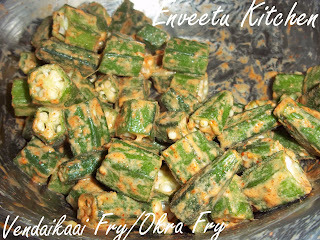 The flours should just coat the okra. Let it sit for 30minutes. 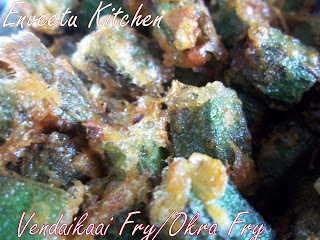 Heat oil in a Kadai, when its hot,deep fry the okra's in batches. Dont turn them as soon as they are dropped!!! Wait for 2-3 minutes, Let it start frying then turn them. They might look clustered, but once they get fried they will separate. Avoid turning too often. Keep the heat to Medium. Once they get browned,take them out of oil and drain on a Kitchen Towel. I didnt have time to do that, since i served them straight from the pan,Hot,Hot!!! Tasted Great!!! yummy and delicious okra fry. 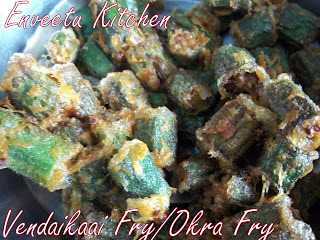 okra simply superb!makes me hungry,dhool presentation! my favorite veggie.. like the fry okra fry looks so delicious the way i make is really different.. the feast is simply superb..
Tasty curry and a sumptuous platter. chanced upon your blog while surfing the web..liking your wonderful collection of recipes here..
Hi, my first time here. You have a lovely collection of recipes. This is such a lovely recipe...comfort food. Crispy and Yummy Treat !